We are currently putting together some helpful information on angling and rigging techniques. 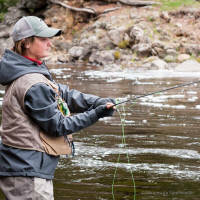 These will include drift fishing, fly fishing with a float, and swinging flies. There are other methods that work, but these 3 are what we have found effective North Shore methods that produce fish. We will also have information how to tie your flies on, add weight, floats, and swivels. stay tuned and thanks for your patience.